Well, Cami cried when she left New Zealand. Can you believe she didn't want to go to Australia? That makes me laugh and mad at the same time. She has been in Australia for four days now. She spent a couple of days in Sydney then went to Shoal Bay. 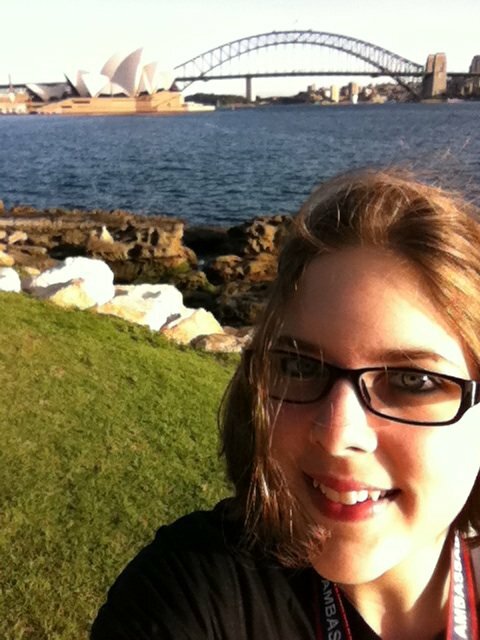 See the Sydney Opera House behind her? Now she is flying to Cairns. Tomorrow she gets to snorkel the Great Barrier Reef. Then her last day she gets to see kangaroos and crocodiles and hold a koala. She will be home Sunday evening. She will barely have time to adjust back to our time zone before Andrea gets here from Germany for two weeks. Then our family will have two weeks without Andrea before Cami gets back on a plane and leaves for Berlin for another two weeks!